December 6, 2018, Moscow, Russia – The RT Channel has provided live broadcasts from the recent G20 summit in Argentina. The channel has relied on technical support of the communications operator Romantis LLC, using the RSCC’s Express-AM8 spacecraft (14 deg W). The unique coverage area of the satellite enabled direct, single hop broadcast contributions from Buenos Aires to Russia, avoiding double hop transmissions from Europe. The G20 Summit was held in Argentinean capital Buenos Aires from November 30 to December 1. The participants of the G-20 are the 20 countries with the largest national economies – Australia, Argentina, Brazil, Great Britain, Germany, India, Indonesia, Italy, Canada, China, Mexico, Russia, Saudi Arabia, USA, Turkey, France, South Korea, South Africa, Japan and the European Union. 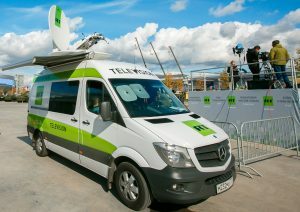 RT’s television network includes eight news and documentary channels, online information portals in six languages, as well as global multimedia agency RUPTLY, offering exclusive media materials from around the world. Round-the-clock news channels in English, Arabic and Spanish, and documentary channel RTDoc, in English and Russian, broadcast from Moscow, while RT America airs from Washington, DC, and RT UK from London and RT France from Paris. Today, RT is available to 700 million viewer in more than 100 countries around the world. According to the international research company Ipsos, 100 million people in 47 countries watch RT every week.